FRIDAY THE 13TH may be considered by superstition to be one of the unluckiest days of the years and new research shows this scepticism is feeding into property prices. The latest House Price Report, released at the start of the month, found that the price of the average home is now nearly €241,000 – 8.9% higher than this time last year. This means that prices have risen by almost 47% on average from their lowest point in late 2013. In order to find the price difference in number 13 homes compared to others, Daft.ie carried out analysis on almost one million Irish properties that have been listed on the site since January 2006. The research also found that, since 2010, Friday the 13th has occurred 13 times. On those days, there are roughly 10% fewer transactions than regular Fridays, which are normally the busiest day of the week for transactions. “We often think of housing markets as being simply about cold laws of supply and demand. But while these are the top-level forces are work, there are lots of quirks of human behaviour that affects any individual property or transaction,” Ronan Lyons, author of the report said. “What’s interesting about this research is that our superstitions appear to affect not only prices – with properties numbered 13 cheaper than average – but also quantities, with fewer transactions on a Friday the 13th than on other Fridays,” he said. The story doesn’t stop there, Daft.ie also looked into people’s perceptions around house numbers and found that nearly one in five of people (19%) would try to avoid buying a property at number 13. 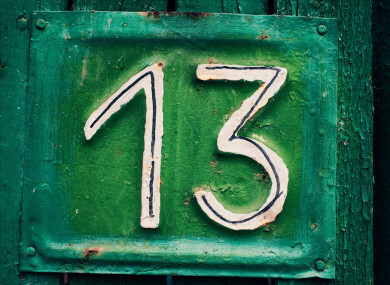 When it comes to superstition and property, triskaidekaphobia – the fear of the number 13 – appears to be having an impact on not just perceptions but actual property prices. The latest House Price Report found that the number of properties available to buy on the market nationwide has continued to fall also, albeit at the slowest rate in over five years. It found that the best value for money is in Sligo where houses are around €134,000, while South County Dublin remains the most expensive with the average house costing €559,000. Email “Not superstitious? You're in luck - it's over €4,000 cheaper to live at door number 13”. Feedback on “Not superstitious? You're in luck - it's over €4,000 cheaper to live at door number 13”.